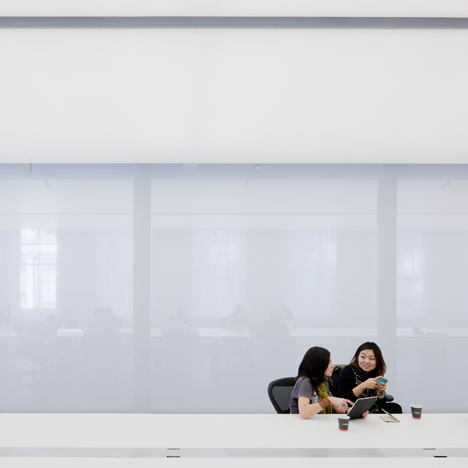 Figures appear as ghostly silhouettes behind the translucent white fabric that partitions these New York offices by architects SO-IL. Completed for production company Logan, the offices contain flexible workspaces with minimal furnishings and decoration, as well as three sound-proofed editing suites lined with rolls of felt. Glass screens subdivide both of the two main office suites and wrap around desks that span each room. White PVC is stretched across the ceiling and is lit from behind to create an even plane of light overhead. Photography is by Iwan Baan, apart from where otherwise stated. SO – IL, a Brooklyn-based design firm, completes new office and studio space for the NewYork opera- tion of LOGAN, a bicoastal production company.The project is located in a 6,500sf corner loft space on the second floor of a land-marked building in the heart of SoHo. SO – IL’s design builds on Logan’s dynamic working model and attempts to create an environment that supports a strong sense of collaboration and collectivity. A large part of LOGAN’s team con- sists of mobile consultants that join the team on a per-project basis.This constantly changing work setting requires little personalized work stations and rooms, but a high level of flexibility. SO – IL rethinks how office space can work given Logan’s organization—creating layers of transparency, and completely shared work spaces. The space is divided into two identical, symmetrical rectilinear spaces. Each long room has a 65 foot continuous custom work table. Accommodating working groups of any size, the shared desks consolidate almost every operation of the company in one place: design, production, and meetings. The end section of each continuous table is divided by glass walls, allowing for acoustically pri- vate offices and meeting rooms to share the same work surface.The supporting functions of the office, including three felt- wrapped sound-isolated editing suites are organized along the periphery of the space. Seamless, floor-to-ceiling translu- cent fabric walls separate the central work areas, visually breaking down the scale of the space, while maintaining a shared environment, and allowing natural light to penetrate. A stretched PVC luminous ceiling provides totally even, shadowless lighting. Looking through layers of fabric, people and objects perpetually appear almost as if out of focus. Fabric walls catch natural light, and like a projection screen, change colors as light changes throughout the day.Together, the seam- less fabric, luminous ceiling, and continuous desks create an environment of abstraction and scalelessness, freeing those working in the space from typical expectations of use. This abstraction, combined with the symmetry of spaces, the spatial ambiguity of the fabric, creates the illusion of reflections when looking into adjacent spaces, creating a dream-like, surreal experience. Team: Florian Idenburg, Jing Liu, Ilias Papageorgiou (Assoc. Principal- in Charge) as well as Danny Duong and Nicole Pas- sarella.